Pharmacy professionals are required to build on their competencies to assure themselves, their patients, and their healthcare colleagues that they are providing quality care throughout their careers. All pharmacy professionals must complete the competence program requirements annually to earn practice permit renewal. Flexible – to accommodate different practice settings and learning preferences and to address the full spectrum of learning. complete any prescribed learning activity that has been assigned by the competence committee. executing a health promotion activity or implementing a patient education program. educating a patient or colleague. Each registered pharmacist and pharmacy technician must complete a professional portfolio—an online record that demonstrates how they have implemented at least one hour of their learning into practice, highlighting measurable outcomes. Each year, ACP selects a percentage of professional portfolios for audit by peer assessors. Portfolios may be selected for audit through random selection, based on a late or incomplete submission, or upon the request of the registrar. The purpose of the audit is to ensure compliance with the requirements of the competence program. In 2017, 493 pharmacist portfolios were audited. Of those, 84 per cent met or exceeded established requirements, unchanged from 2016. Twelve per cent did not meet the established requirements due to minor deficiencies. Another four per cent of portfolios audited had significant gaps, errors, or omissions, and were referred to the competence committee for support. This was the first year pharmacy technicians’ portfolios were officially audited. One hundred and eighty-one pharmacy technicians’ portfolios were audited by peer assessors. Results of the audits were not available at the time of publication. Overall, the peer assessors were inspired and impressed with the work pharmacy professionals are doing across practice settings. However, they did express a need for pharmacy professionals to provide more detail in their portfolios, including information about the desired outcome of the learning being implemented into their practice. Since 2007, pharmacists in Alberta have had the ability to adapt prescriptions initiated by another prescriber or apply for authorization to initiate drug therapy (i.e. : prescribe drugs). 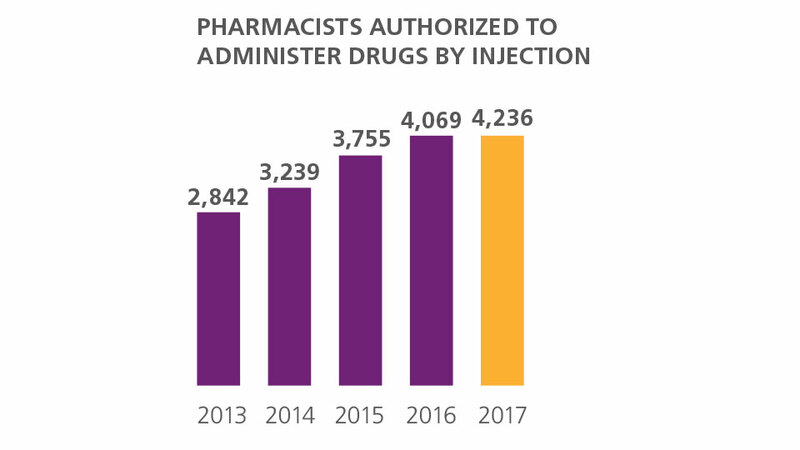 As of December 31, 2017, 2,181 pharmacists in Alberta have obtained additional prescribing authorization, up from 1,658 a year earlier.